Physiological brain changes associated with the aging process do not lead to sudden, unexpected death; in fact the older the person, the less unexpected death becomes. As mean life expectancy has increased in the industrialized Western world, so has the exposure of the forensic neuropathologist to the normal changes and pathology of the aging brain. Neuropathological examination must make a clear distinction between age-related and disease-related alterations of brain tissue (Braak et al. 2002). 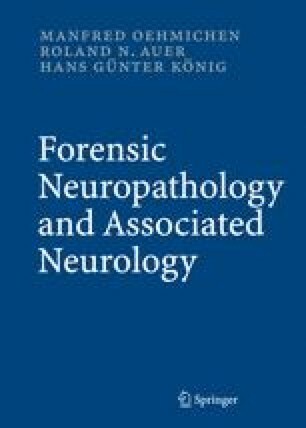 The task of the forensic neuropathologist is to distinguish changes due to acute or chronic exogenous effects from changes attributable to physiological endogenous effects. Neuropathological findings can also provide additional — though limited — information regarding the psychopathological state of the deceased. For these reasons the editors have deemed it necessary to discuss the neuropathological aspects of aging and brain pathology in this Part on clinical neuropathology.